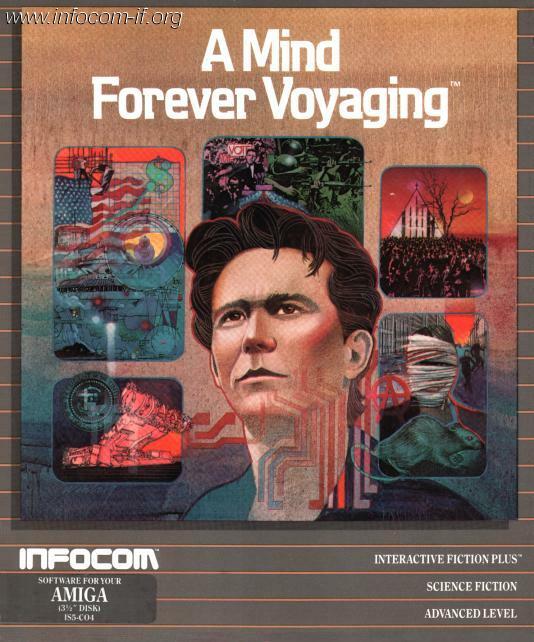 Welcome to A Mind Forever Voyaging (which, for brevity's sake, will henceforth be referred to as AMFV). In this story, you will be PRISM, the world's first sentient machine. 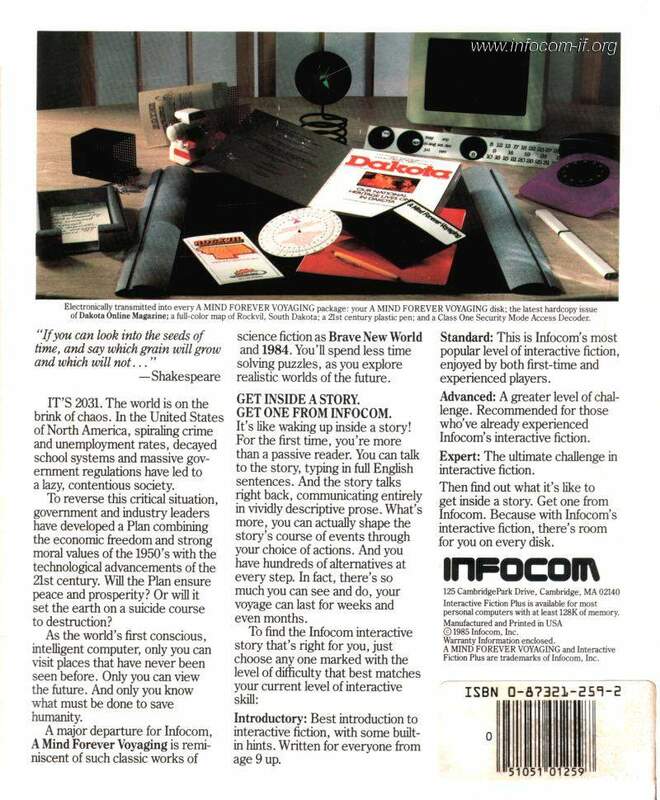 Before you "boot up" your disk, make sure you read the short story in the first part of the booklet. The story begins in the world of 2031, a world on the brink of chaos. The economy of the United States of North America (USNA) has been stagnating for decades. Crackpot religions are springing up all over the place. Crime and urban decay are rampant. Schools have become violent, chaotic places ill-suited for educating children. Today's youth frequently use joybooths to "tune-out" the world, leading in the extreme case to joybooth suicide, where a psychological addict wastes away in his or her private nirvana. The global situation is even grimmer. The calcuttization of the Third World has almost reached its limit, causing extreme overpopulation and poverty. This has created a climate ripe for East Bloc adventurism, exploiting instability and fanning the numerous flash points around the globe. The superpower race to build an impenetrable missile defense has ended in a tie, with the foreseeable but unforseen result that an even more dangerous arms race has begun -- a race to build miniature nuclear weapons, some as small as a cigarette pack, and smuggle them into enemy cities -- a race which threatens to turn the USNA into a giant police state. Things are bad, and it appears that they can only get worse. So when Senator Richard Ryder, along with a small group of leaders from government, business, and the universities, announces the Plan for Renewed National Purpose, everyone is only too willing to embrace it. Only one thing stands between the Plan and its adoption: a test of its validity. That's why you have been "awakened" from your simulated life and had your true nature revealed to you several years ahead of schedule. You have been chosen to use your unique abilities to enter a simulation of the future, based on the tenents of the Plan, in order to check its effectiveness. The eyes of the world are on you.